The most unique and advanced rubber strap for your Panerai Luminor Marina. 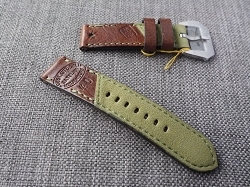 Ted Su's original design Concept Rubber strap, specially designed for 44mm Luminor Marina models. The goal is to achieve a totally unique rubber strap that's never seen on the market, which not only looks great, but with real performance too. The Concept Rubber strap encases the Luminor Marina against any side impacts that may cause damage to the lugs, the crown guard and the case. 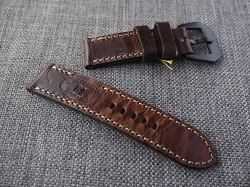 It's one piece design distributes the pulling forces away from the lug screws, which is commonly the weakest points on a conventional watch strap. such as jogging, tennis, swimming...etc. 1. Fits only 44mm Panerai Luminor Marina. 2. Fits both automatic and manual winding models. 3. Works with both the traditional screw-in lug or the new quick release systems. 4. Fits 16.5cm to 20.5 cm wrists. Fits 6.5" to 8.0" wrists. 5. Uses 26mm screw-in buckles (included). 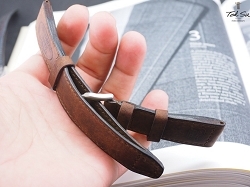 *Strap changing experience is recommended for using this professional strap. when is this coming to market? i have been waiting over 3 years. it took less time for panerai to develop their inhouse movement! Dude, that is some nice concept for the Luminor rubber strap!